These sturdy wooden blocks were invented in 1912 by Caroline Pratt, a school teacher in New York City whose students used make-believe to better understand the world around them. The inventor of kindergarten, Freidrich Frobel, designed a block system of his own in 1837, but Pratt’s larger blocks became the standard for young builders around the world. The lack of color leaves room for the imagination and the big block size allows for quick construction. Shapes like half-circles and triangles provide visual flair, but the square and rectangle shapes make up the core of every creation. The unit block’s simplicity and durability solidify its place in playrooms everywhere. 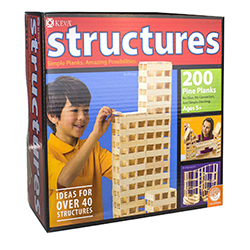 Known as Kapla, Keva or Planko, these thin wooden planks can be stacked to make staircases, bridges and towers. In 1987 Tom van der Bruggen planned out his dream home with wooden blocks but needed smaller pieces to represent the floor and roof, so he created what he called “gnome planks”. In Dutch the phrase “kabouter plankjes” was eventually shortened to Kapla. The Kapla planks are more substantial than popsicle sticks but more versatile than unit blocks. The company Mindware sells a version in America called Keva which has the exact dimensions as Kapla. 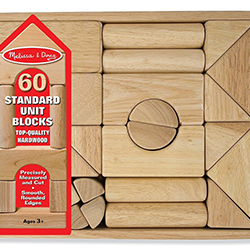 A hard-to-find Canadian variation called Planko measures longer and features a groove on one side for angled stacking of pieces. All types of wooden planks are perfect for fine-tuning the height of a roller coaster track, or building creepy Wicker Man humanoid structures. These flexible plastic rails are made by an Italian company known for their gear playsets and pixel art kits. Far superior to the simple stackable Marble Run chutes, the Skyrail tracks can be crafted into hills, loops and spirals of any size or shape thanks to a terrific support system. Newer “Ottovolante” sets feature sidewalls on the curves to prevent the marble from falling off at high speeds, although seasoned marble run builders should choose to remove the barriers and construct a course that will skillfully regulate the marble’s velocity around turns. The track pieces can snap if they are twisted too tightly, and bumpy connections between segments can send the marble flying. But for miniature roller coasters that sprawl entire houses or backyards, these red and green rails are hard to beat. 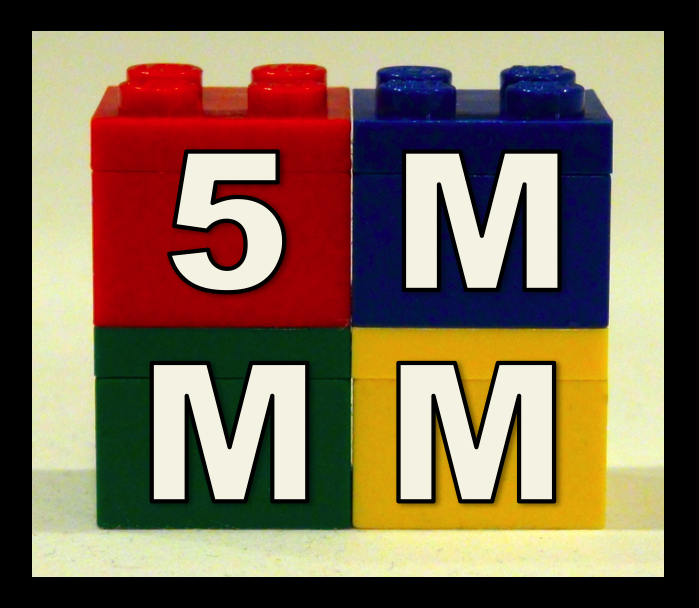 Currently the world’s most popular construction toy, LEGO bricks are colorful plastic pieces that lock onto each other and can be assembled into almost anything. Their small size may frustrate inexperienced hands and the steep prices can intimidate buyers, but the quality and variety of the kits keep fans coming back for more. The building process can be so engrossing that it’s easy to forget to play with the creations afterward. The LEGO train sets feature tracks that work great for roller coasters, although steep angles between pieces on a downhill slope can derail cars. The wide gauge of the cars make LEGO trains the easiest to film with an onboard camera, plus the railroad cross-ties contribute to a miniature realism and a higher sense of speed for viewers. The first Hot Wheels cars and racing sets were released in 1968 and they crushed the competition, including the more realistic yet slower Matchbox cars. Speedier and more stylized, Mattel’s colorful vehicles and distinct orange tracks hold a special place in the hearts of many. The track kits don’t include a great support system other than plastic vice grips designed to lock starting lines into place, so builders will have to get creative and use books, boards and blocks to shape their roller coasters. Plus, the lack of variety in curve pieces can be frustrating as most curves are either too narrow or too sharply banked. But out of all the track systems, Hot Wheels is the most stunt-friendly with jumps, loops, and battery-powered boosters ready to send a car flying right out of the box. At the turn of the twentieth century, inventor Lionel Cowen built an electric train to advertise products in a New York City shopping window. His trains became more popular than the products they were advertising, and soon Lionel Trains were a household name with their famous three-rail metal track and motorized accessories. Aside from standard Christmas tree loops or detailed model layouts, Lionel rails also work well for “gravity railways” (or “funiculars”, as H.G. Wells called his roller coasters in Floor Games). Cars rolling downhill gain speed quickly with their heavy weight, free-spinning wheel trucks, and greased bearings, so watch out on the turns! A plastic rod connection system similar to TinkerToys, K’Nex models are often large structures with motorized moving parts. The 1995 Big Ball Factory set paved the way for multi-path ball machine contraptions and the 2001 Screamin’ Serpent roller coaster set introduced a new tubular rail track system. Today, the company sells flexible coaster track compatible with Micro K’Nex pieces. The roller coaster cars clamp securely onto the rails, allowing for crazy outward loops at high speeds. Unfortunately, most kits are unrealistic compared to real amusement park attractions, but the true enthusiast can buy multiple sets and combine them into large models with intricate layouts and detailed structures. The lightweight cars run out of speed fast and the twisty track can be a real pain for designing supports, but once a model is complete and motorized it is the most reliable of toy roller coasters.